Editors note: At our recent GRN Workshop in Kane County I announced I was looking for guests to write posts for this blog. Juli Mason was in the audience and below she gives us a helpful report. If you have an topic you want to share contact me and I or someone with the GRN will work with you to post it here. Also, I am reposting this one because it seemed to not email out the first time. Fall is a lovely time here in northeastern Illinois. The leaves are turning, mornings are crisp, and invasive shrubs stick out like sore, green thumbs against the senescing native vegetation. 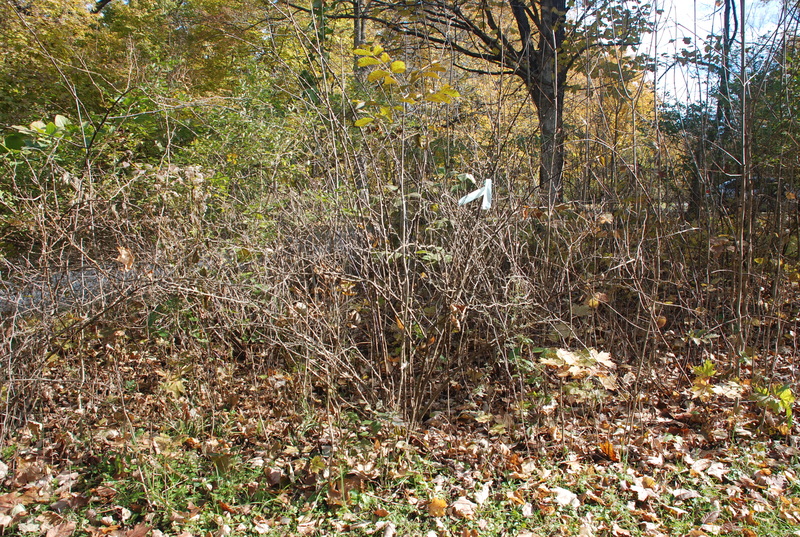 Previously, Bill Kleiman has posted articles extolling the virtues of using basal bark application of herbicide as an efficient and effective method to kill bush honeysuckles. He used 17% Garlon 4 in bark oil. I have also found that treatment to be effective, but have noticed that the oil kills all plants in the overspray zone. This usually isn’t too egregious as long as you keep the sprayer pressure low to minimize overspray. 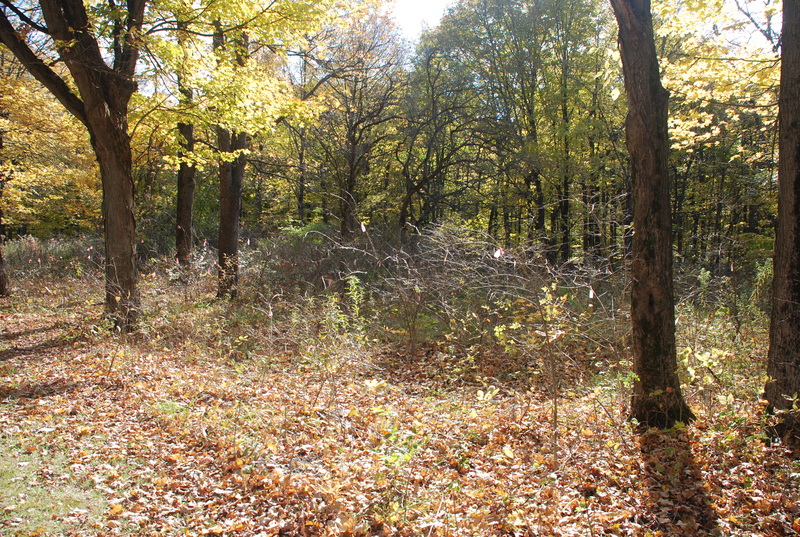 The space fills back in with the surrounding vegetation within a year or so. 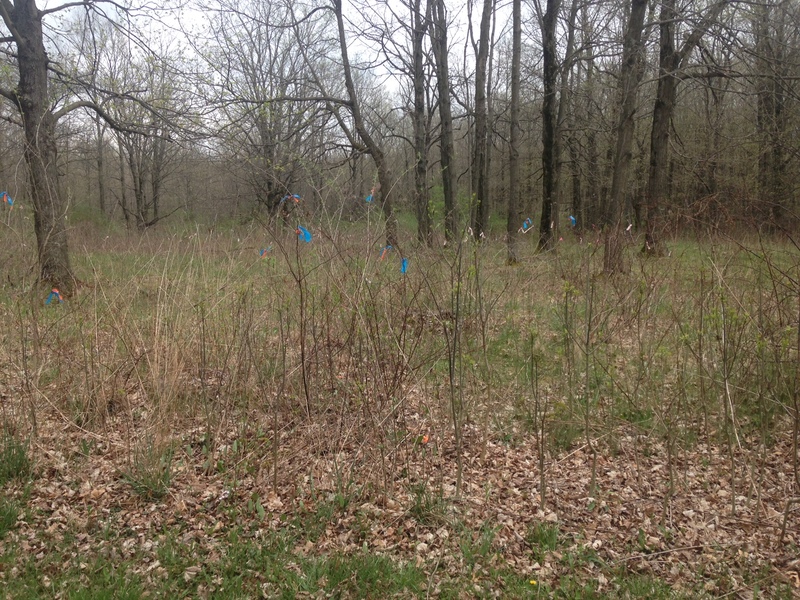 However, there have been a couple of cases when it rained within a day after the basal bark application or it was done over snow cover and the oil washed down slope, leaving a zone of death heading down the hillside. Guess it takes oil a while to “dry”. 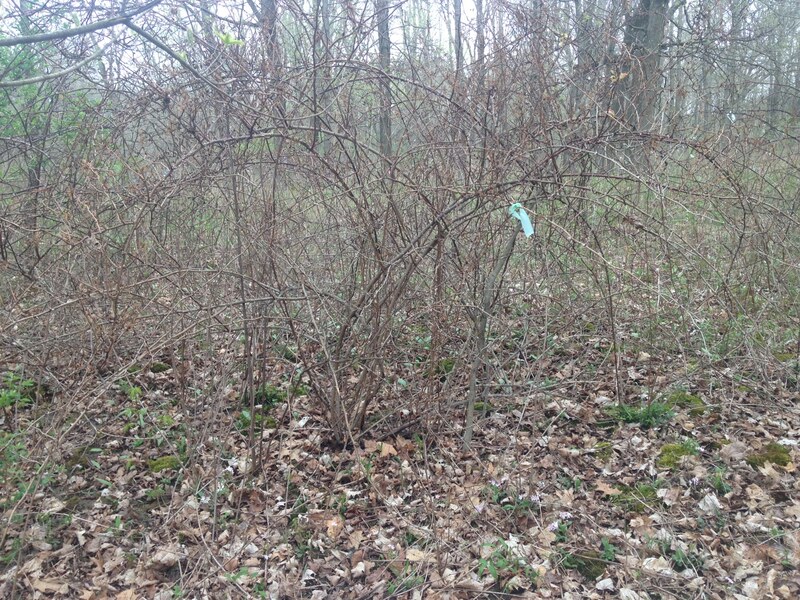 Caption: Another dead invasive multiflora rose from the basal bark treatment. This entry was posted in Uncategorized and tagged basal, basal bark, emulsion, honeysuckle, invasive brush, Julianne Mason. Bookmark the permalink. Did you see this? We should try a similar method for buckthorn. Cameron: Did you receive the blogpost by Juli on basal bark via email? Some did not receive an email and I trying to figure out what happened. Yes, these methods should work well on buckthorn and autumn olive too. This method would put less crop oil into the environment while spraying. However, where I have volunteered we are not permitted to spray. If herbicide was being applied by paint roller then I would think having a higher concentration of active ingredient and applying a proportionally reduced amount of mixture would be the best way to also reduce the amount of crop oil needed (although this probably would not be allowed either). 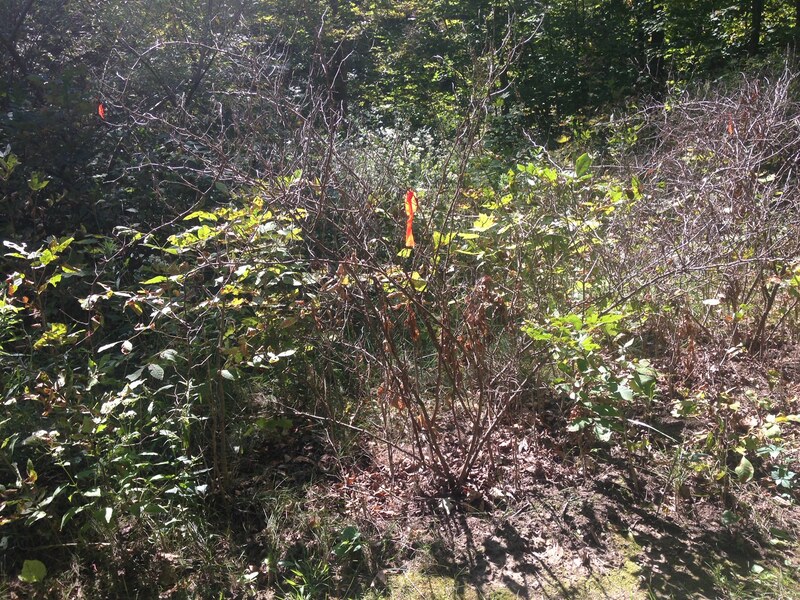 The invasive woody species control I have help do or observed is mostly done during winter. I would be curious to know the results of using this, or Bill’s, method during winter. Of course, an emulsion probably would not work when the temperature is below freezing. Cut stump application is often what public agencies mandate in Cook County. Being able to apply herbicide below freezing is the main advantage of using an oil based herbicide if what you have been limited to is cut stump application. Bill Kleiman here: Thanks for comments, James. The study I did a few years back was in May and we got 100% kill with 17% basal bark on honeysuckle. Recently, Kaleb Baker of NIU is doing a similar study but in the fall, winter and spring. Before working up all his data, he reports that he got very good control in all seasons. Kaleb Baker getting good results applying triclopyr ester on the basal bark of Asian Honeysuckles makes me wonder what people in my area have been doing wrong. People have been applying triclopyr ester to the cut stump and a few inches down the stem. 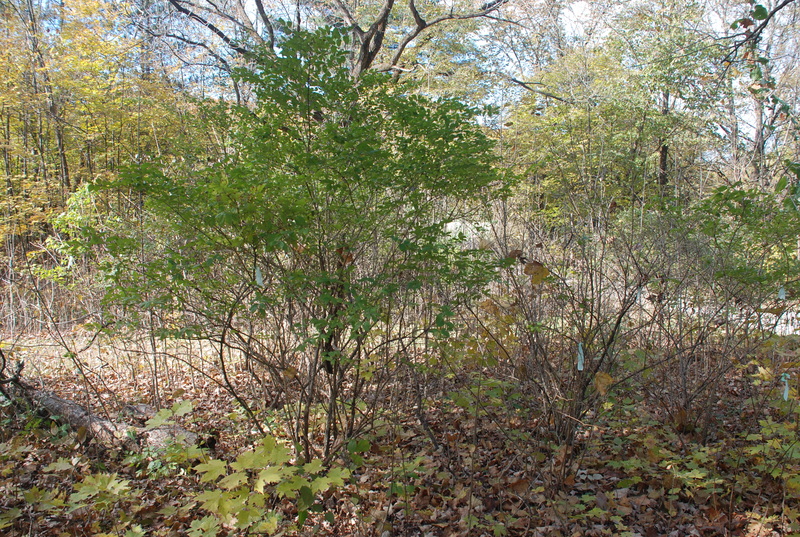 I have not observed any success on Asian honeysuckle although buckthorn is typically killed. I wonder if people are not putting on enough herbicide for Asian honeysuckle control. In contrast, when I have frilled tree like honeysuckles and put 41 % glyphosate in the cut, all the shrubs I have treated have been killed. I have also had success with 41 % glyphosate on cut stumps if enough is applied. I think painting it on once isn’t enough. I plan on trialing painting it on thick twice and giving it time to absorb into the stump in between coats. I am hoping applying the herbicide twice with give a high percentage of control (95 % or more). People’s attempts to use the minimum necessary amount of herbicide has come with the cost of doing rework when control is poor. I have seen a lot of people apply too little herbicide and get poor (or very poor) control. Often, follow up is not done which leaves the site in a worse situation than before the control effort had occurred. Bill is probably getting good results because he applies the herbicide thickly, whereas other people are not getting decent control because the herbicide is applied thinly. We need to quantify the size of the invasive species, the amount of herbicide being applied to each individual, and the resulting successes and failures. This will give organizations the information they need to train herbicide applicators to accurately estimate the amount of herbicide that needs to be applied to get good control while not unnecessarily using too much. The honeysuckles that appear to have “shaken off” the herbicide application were likely sprayed with mostly just water. Oil floats in water and emulsions can break very quickly. Try making the herbicide emulsion and putting it in a clear container so you can see the speed of separation. Some honeysuckles probably got mostly water and others got mostly oil and herbicide mixture.